The Headway theme holds so much promise. It’s the only theme framework that really does deliver what it says on the box. Using Headway, you can – in real life, not some upbeat marketing fantasy universe – design your own WordPress website, without coding. That’s why I’m such a big fan of Headway and recommend it so often. BUT, Headway isn’t perfect, and there’s plenty to be improved upon. I believe in simplicity and elegance, achieved through continuous refinement. Headway 3.6 though, isn’t as much about refinement, as it’s about rewriting. Headway 3.6 is a major update, make no mistake about it. I don’t think any of the earlier 3.x updates has brought about as much change in a single update, as Headway 3.6. The Design Editor, is all new. And the design editor is what this blog post is about. You see, it brings some much-needed solutions to some cumbersome challenges, most Headway-users will be glad to get rid of. But while using the recent betas of Headway 3.6, I couldn’t help noticing that I wasn’t entirely happy. Something nagged me. Something didn’t feel right. And it was easy for me to put my finger on what felt wrong. Complexity had gone up. Usability gone down. I could see how my upcoming Headway video tutorial could become a more difficult course, for the participants to take. It’s extremely important to me, that the tutorials will be easy to understand, comprehend and follow. I wanna build your skills. Make you able to do stuff, on your own. The illustration above shows how flexibility almost always comes at the cost of increased complexity. Most “regular” users need some flexibility, but not a lot. If it didn’t come at the cost of complexity, they might welcome some extra flexibility, but that’s rarely possible. 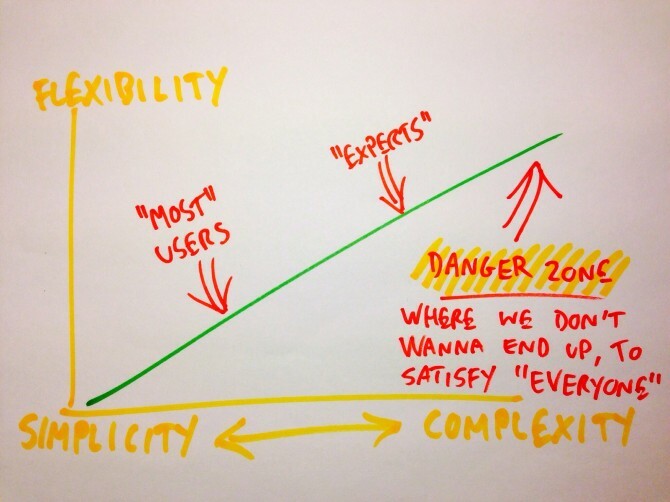 Experts, however, often need and crave a higher level of flexibility (which also often means increased risk of problems, by the way) and are generally fine with the increased complexity. They’re experts after all. Headway 3.7 – codename “Pareto”? I’ve often wished for Headway Themes to release a Headway Lite version. One that keeps the best of Headway, while leaving out the advanced features, most people won’t really need. A “lite” or “core” version of Headway wouldn’t be a bad idea. A version catering to 80% of users needs, with roughly 20% of the complexity of the full, pro version. Hence the Pareto reference in the above headline. – and PageLines DMS has its open source version, and Pro (subscription) version. Yet, I felt it would be a waste of time to start moaning about Headway 3.6’s direction. It’s apparent to me that Clay and the rest of the Headway team has already put a lot of effort, into making Headway 3.6 the ultimate, most supreme version of Headway ever. Then, a few days ago, I had an enlightening Skype chat with Headway Themes’ lead developer, Clay Griffiths. I decided with myself, that even though I didn’t feel like shaking things up, I had to voice my concerns, honestly and openly. Without further ado and beatin’ around the bush; I’ll now share with you what I feel could have been done better, in Headway 3.6 – and will hopefully be fixed, sooner than later. 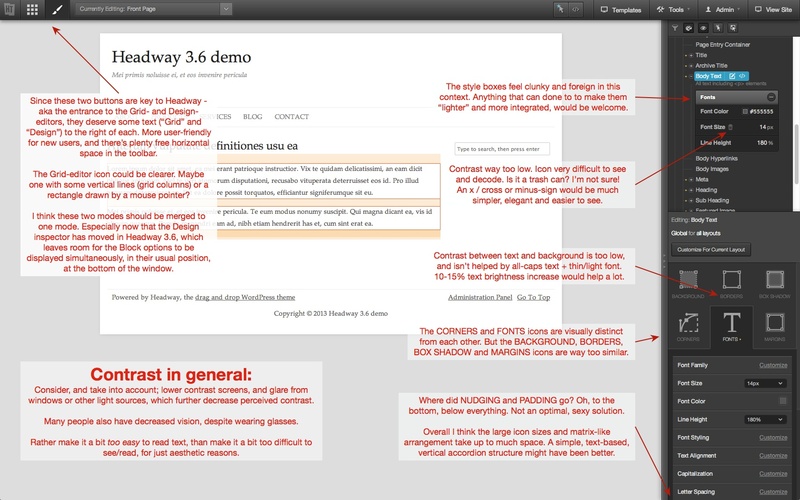 The first screenshot (click for a larger, 100% version) clearly illustrates my biggest issue with Headway 3.6 – namely the new design inspectors tendency to overwhelm, than give me clarity and a sense of overview. I know the reasoning behind – and thinking that has gone into – the new design inspector. It aims to make it easier for the user to see where and how any given element was styled. A task that has sometimes been more difficult than it necessary, in previous versions of Headway. 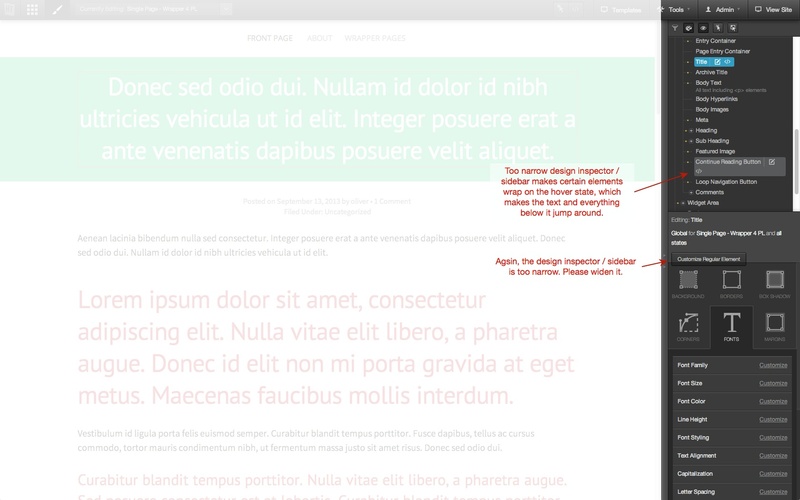 And I welcome solutions to that challenge, but in all honesty – I can’t enjoy using the new design inspector. It isn’t elegant. It isn’t simple. It doesn’t offer clarity. Rather it makes me feel intimidated. The prime function of design: is to make life easier. Click to view 100% actual size! The intense density of Headway 3.6’s new design inspector, as can be seen above, is by far the biggest gripe I have with Headway 3.6. It makes my life as a web designer less fun – and more straining to my head, which I’d much rather devote to design and creative thinking. It has taken me quite a few hours to thoroughly test Headway 3.6, make up my mind about these issues, annotate screenshots and write about it. Please realise I wouldn’t do that, if didn’t care deeply about Headway getting as great as it can possibly become. Apart from the above critical remarks, it’s very clear to me, that the future is ultra bright for the Headway theme and community. So much good stuff is happening behind the scenes at Headway Themes, which will soon make it even more appealing for all users to be a part of. But what do you think about the Headway 3.6 beta, and what I’ve shared with you here? Let me know! PS: The Headway 3.6 beta can be downloaded at HeadwayThemes.com by all registered users. Thanks for your very well thought out review and for the ideas you included. Rest assured we are looking at every single one. As 3.6 matures even further, I am sure you will see some changes which will answer many if not all of your concerns. And thanks to the others here in the comments. It is always refreshing to see well thought out ideas and even criticism which provides substance to the ideas to what Clay and his Team are doing. Oliver, I think you want to go too fast. The changes made, compared to 3.5 are, in my opinion, very welcome and apart from some design issues, very clear to me. Yes, contrast is not what it can be, being able to change the width of the design inspector would be nice, but these are minor issues. I do not feel the clutter. For me it is much easier to target the different elements then in 3.5. Of course there is still a lot that can be done and in that respect I want to encourage looking at iWork and Apple (an easy remark pointing at the masters of UI). But, please, keep on challenging Clay and his gang to think about it and make it better, it will benefit all of us in the end. Good to read your take on it. I’m glad you like Headway 3.6, overall. And You’re right: indeed I want to go fast. I’m a visionary. Hi Oliver! Fantastic UI analysis! I agree with you, low contrast’s bad, and the 4 icons are very similar. Thankfully 3.6 is in beta, so some tweaks can make a pretty launch. Do you dream about a Headway “lite”? For me it´s very clear how to achieve the “perfect” solution: just mimic the decades long and everybody knows software like Word, Power Point, and such – front end editing, drag in drop boxes, images and such. Create cells, fill borders and background with lines, colors, gradients, and etc. Hide the “divs” and all other technical expressions from the user. Why design a text tool when all you have to do is just copy the default toolbar used in every word processing since 1990? Proof of concept is the new Apple’s iWork suite, it´s (to me) unbelievable to believe the quality of the app running in HTML 5 in any modern browser. Just take a look at the Keynote 3D transitions, or the awesome images with alpha with in between text magically been set up. 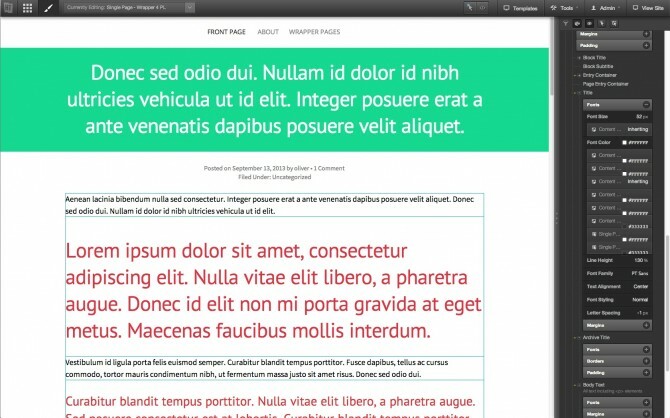 The team behind Headway Themes are doing a great job, and this version will be very welcome. I can’t deny Pagelines DMS showed the way to modern theming, front end editing is the base feature to achieve this. Unfortunately, Pagelines couldn’t achieve it’s vision technically, so it´s software suffers from various bugs and uncertainty (DMS now in v. 1.1). Headway Themes is today the finest WordPress framework out there. I totally, 100% agree with your thoughts on the “perfect” solution / framework. Regular end-users (whom I tend to call average Joe and Jane) shouldn’t be presented with abstractions like div’s and other technicalities. We can’t all be coders. Some people just have a business to run. And they’re the real market, where the real money is to be made, for the theme framework provider who finally gets it right. Yeah, PageLines DMS doesn’t feel mature enough, yet. It’s quite slow, by a big margin, compared to most of its competition. And the team + forum moderators doesn’t seem up to the task. “Less hype, more love” would be a solid credo for PageLines success in 2014, if you ask me. And in that respect I think the Headway team, although small, does much better. And I’m certain they’ll step it up a notch or two in 2014! “Some people just have a business to run.” and “Less hype, more love”. Right on spot! Sometimes it seems that wide access to technologies is sometimes a trap: anyone can setup a WordPress site with one click (php, my sql, apache, a complex set up), but try to remove a header from one specific page. Sometimes it´s ridiculous to think the amount of time required. Pagelines attitude of “dumping” previous clients from version 2 was very regretful. That personal projects sounds exciting and right up my alley – send me a mail man – go go go! Got it – thanks! Will reply later today. Thanks for the post, Oliver! It was great chatting with you on Skype. 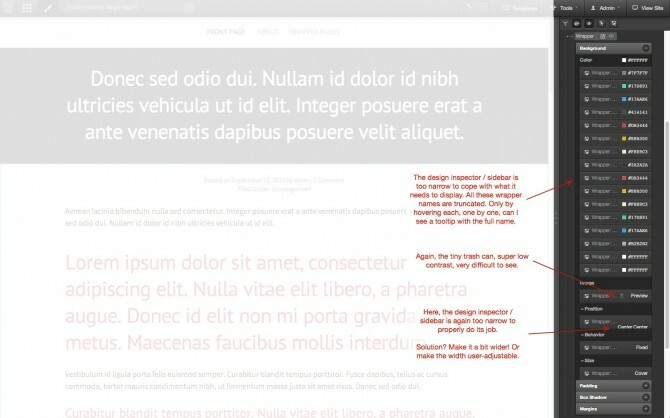 Now that we have the framework laid for the new Design Editor sidebar, we’re going to be refining it in coming updates. I’ll definitely be sharing this with the team and I’m sure we can come up with solutions for nearly all (if not all) of your concerns. That’s great to hear Clay! Wanna add as well: the mere thought of the work and effort you’ve put into Headway 3.6 makes my head spin. I know it ain’t easy to pull off such an update. I believe strong end results in design often needs to go through some iterations of refinement, often also including some debate, disagreements, sharing of opinions, and so on. I’m glad you’re as open to suggestions and feedback as you are, and have your own visions as well.